Hello and welcome back! It’s Day 20 of our 31 Days of Horror series, and today we’re talking about 1981’s The Fan, starring the lovely Lauren Bacall. If you’ve spent much time with me, either in person or via my internet ramblings, you know that I am in a committed relationship with Classic Hollywood. We are not exclusive, per se, but let’s face it–I’m not really interested in seeing other people. Charles may take every opportunity to rib me about my love of Barbara Stanwyck (we even did an episode about her on The Good, The Bad, and the Podcast!) and other 1940s actresses of a similar ilk, but I’m #sorrynotsorry. I’m of the firm belief that they don’t make ’em like they used to, and practically no one validates that theory more than Lauren Bacall. For whatever reason, Lauren Bacall doesn’t seem to be as well-remembered today as she deserves to be. She is in certain circles, of course, but I don’t know that she’s a household name like some others from her heyday are: Clark Gable, Jimmy Stewart, Bette Davis, Katharine Hepburn, etc. I would venture a guess that, even if you’re not a big classic movie person, you know who those people are. I don’t think a lot of people who aren’t into the classics know who Lauren Bacall is, and that’s a shame. I hope I’m wrong, but there it is. If you haven’t seen any of her early movies, I want you to to take the next possible opportunity to watch To Have and Have Not (1944). It is one of my top 10 favorite movies of all time, and I don’t think I’m exaggerating when I say that it will blow your freakin’ mind. The dialogue is electric, and the chemistry between Bacall and Humphrey Bogart is the stuff of cinema legend. Take a look at the clip below, and you’ll see what I mean. Just, wow. Bogey and Bacall went on to make 3 more movies together, all of which are great, but this one is by far my favorite. It even launched an off-screen relationship between the two stars, despite a staggering age difference (she was 19 when they met, and he was 45). Theirs was one of the few Hollywood romances that actually lasted, and they remained happily married until Bogart’s death in the late 1950s. I suppose I’ll rein myself in now and get back to the matter at hand, but I do hope you’ll take my advice and check out some of Bacall’s other work. You won’t regret it. So, The Fan. 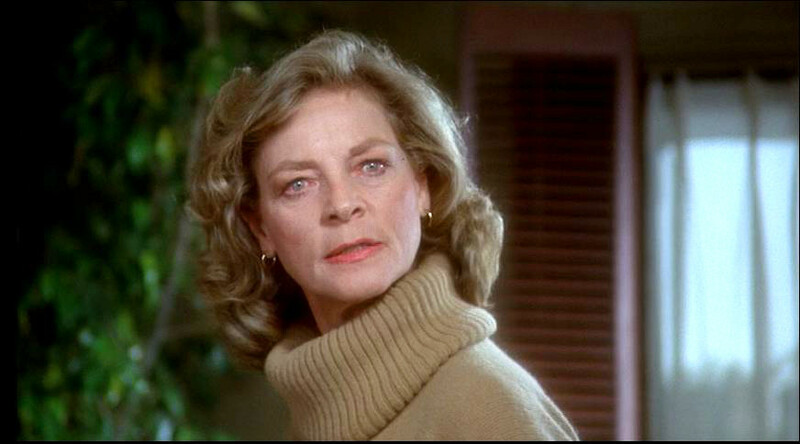 As you might be able to guess by this point, Lauren Bacall is my favorite thing about this movie. It’s really just an okay film, skippable in the grand scheme of things, but her performance lends enough weight to make it enjoyable if you do happen to come across it whilst channel-surfing. Bacall stars as Sally Ross, a formerly-glamorous and still-handsome actress of 50ish, who is trying to expand her horizons by breaking onto the stage musical scene. While rehearsing for a new part, she begins to receive a steady flow of passionate letters from one Douglas Breen (Michael Biehn): her self-appointed “biggest fan”. At first, Ross isn’t even aware of the letters, because her secretary responds in her stead. The correspondence grows more and more unseemly, however, and in one racy letter Breen tells Ross that “soon they will be lovers” and he “has all the equipment to make her very, very happy”…ew. Eventually, Breen becomes impossible to ignore. Mentally unbalanced, furious that Ross will not respond to him personally, and still convinced that they are in a mutual relationship ordained by Heaven itself, Breen commits a series of vicious attacks on Ross’s friends with a straight-razor. When she STILL will not give him the attention he craves, Breen focuses his violent wrath on Ross. If he can’t have her, neither will anybody else. DUN DUN DUN. We’ve seen similar stories both on-screen and off. The Bodyguard, Selena, the murder of John Lennon…it’s pretty disturbing that this is the kind of thing that really happens. But despite a legitimately haunting premise, The Fan just isn’t quite as powerful as it could be. Bacall does her part, but the rest of the film is missing something–I’m not quite sure what. Even James Garner, who is usually excellent, is slightly one-dimensional here. I don’t know, I guess I just wanted more from this movie. It’s still fairly decent, but it’s better to go in with moderate to low expectations. Tomorrow, Charles will be discussing the 1982 remake of Cat People, which should be interesting to say the least. Be sure to check that out, as well as the rest of our selections for 31 Days of Horror! !